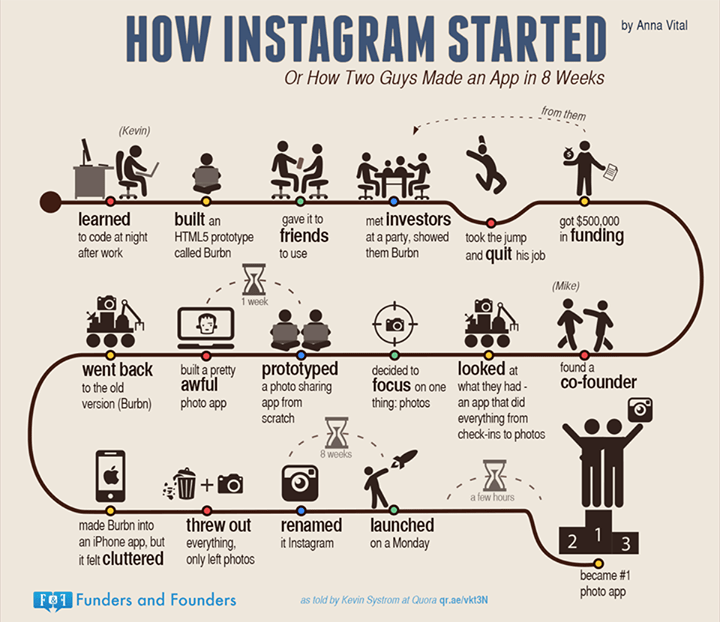 This infographic explains how two guys launched the decade’s killer app in two weeks. In a recent Quora post, Instagram’s Kevin Systrom explained just how IG got off the ground in two weeks. Funders and Founder’s Anna Vital breaks it all down in this thought-provoking infographic. SourceCheck out Kevin‘s full post here. You will never duplicate IG’s success. NEVER. You can’t always copy other people’s success, but you can learn from them. You HAVE to know your niche. It’s all about the niche. Delivering the best user experience is winning most of the battle. Momentum is a precious resource. It’s almost always best to get off the ground first, then fix things later. Is that an opportunity? Up to you to find out. Anna Vital is a total boss at these infographics. Play a few games of Dungeons and Dragons for a fun way to find out about teamwork.